What are the Functions of Cloud Identity Management? It’s often said that change is hard—but does it have to be? When a new approach is necessary, and progress is a must, embracing change becomes easier than resisting it. In the identity management space, this type of necessary change has arrived in the form of the cloud. SaaS and IaaS are an unstoppable force, making cloud identity management required for IT organizations to move forward with more flexibility and more self-governed authority. Microsoft® Active Directory® has been slow to embrace a comprehensive cloud directory, leaving extensive gaps for innovators to fill. But the first generation of disruptors in this space (e.g. single sign-on (SSO) solutions, identity bridges, privileged identity management) have failed to address the full scope of cloud identity management. So let’s ask, in a perfect world, what are the functions of cloud identity management? We think about the answer to this question everyday at JumpCloud®. Our Directory-as-a-Service® platform takes a 100% cloud-based, holistic approach towards modernizing identity management by connecting end users to IT resources regardless of platform, location, protocol, or provider. IT administrators can benefit from increased security, greater efficiency, and less friction through platform agnostic cloud IAM. From system and device management to G Suite™ and Office 365™ integration, explore the following posts to understand the functions of cloud identity management available through JumpCloud Directory-as-a-Service. In direct cooperation with identity management, system management enables IT admins to control devices, all the way from the credentials that grant access to the machine to security settings and updates. Most platforms that call themselves Cloud IAM don’t offer robust system management functionality, but that doesn’t mean that they can’t. When we talk about system management, think of Group Policy Objects (GPOs) on Active Directory—but imagine it working for Mac® and Linux®, in addition to Windows devices. JumpCloud Directory-as-a-Service offers a library of Policies that execute GPO-like functionality across OS platforms. We’re expanding on our library of Policies every month, but for that which can’t be done with Policies, we have our versatile Commands feature. Commands provides deep system management capabilities executable by scripts or ad hoc commands, with results sent back to the JumpCloud console for confirmation. Read on to understand more about how system management and device management can be centrally unified through the cloud. As a core protocol in the identity and access management space, LDAP has established itself as the backbone of authentication for innumerable applications and organizations over the past 20 years. With cloud adoption across the board and an ever-evolving IT landscape, on-prem LDAP implementations have been stretched to their limit. Read on to understand how the JumpCloud LDAP-as-a-Service function bridges the gap for IT organizations and delivers a central user management solution across platforms, providers, protocols, and locations. SSO into apps can be a key function of your cloud identity provider. But at its best, cloud identity management can do much more, and take the meaning of SSO up a notch. That means one set of credentials not just for your web apps, but for your systems, on-prem apps, file shares, networks, and servers—whether on-prem or in the cloud. Read on to understand more about how True Single Sign-On™ expands ease-of-access to a much wider range of IT resources. JumpCloud Directory-as-a-Service seamlessly integrates with Office 365. Acting as the authoritative source of identity, JumpCloud can provision new O365 users, make password changes, and more, all through our cloud-based directory. Read on to understand more about how your O365 implementation can benefit from cloud identity management. As G Suite soars in popularity, some organizations are trying to use it as their core directory, while others are trying to link their G Suite users to their existing on-prem directory. As with Office 365, JumpCloud’s integration with G Suite allows IT organizations to do more with their users’ existing Google identities. By shifting identity management to the cloud, organizations can exercise a full-featured directory to control onboarding and provisioning without the hangups of legacy solutions. Read on to understand more about how this Cloud IAM function for G Suite integration effectively manages your Google identities. By harnessing all of JumpCloud’s cloud identity management functions listed above, your organization is empowered with a directory services platform that provides users with secure authorization and access to the IT resources they require. Driven by diversification of new resources and a progressive model of delivery, JumpCloud Directory-as-a-Service is high-stepping over legacy solutions to replace the core functions of IT organizations. Read on to understand more about how cloud identity management directory services are relieving the workload of IT admins and revamping IT environments for the better. 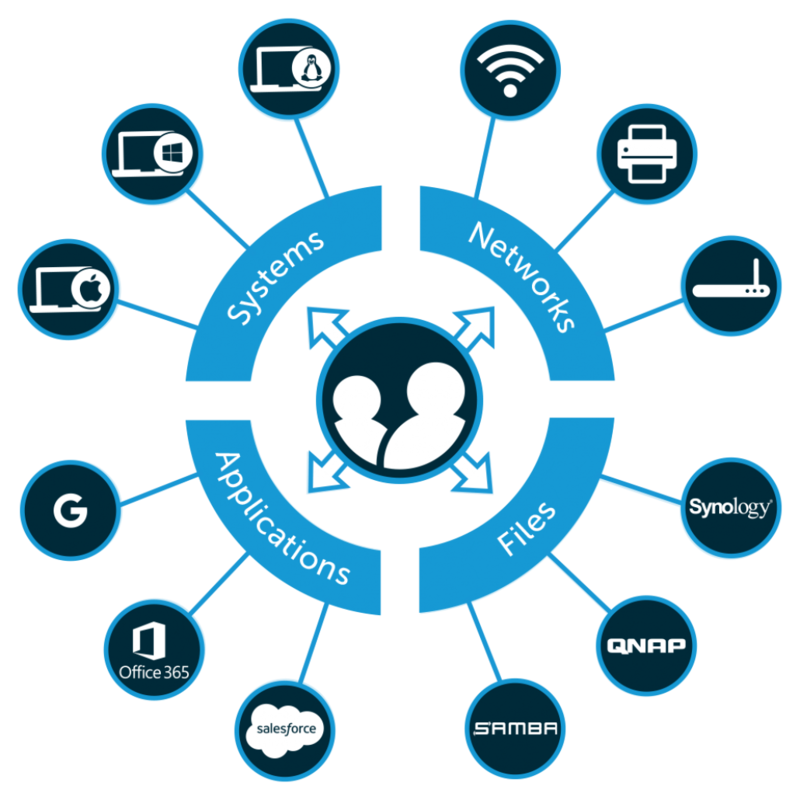 Want to know more about how your IT organization can benefit from a combination of these cloud identity management functions? Contact us directly, and we’ll be happy to answer any other questions you have. Personalized demos can be easily arranged, or go ahead and sign up to start exploring all that JumpCloud has to offer. Your first 10 users are free, forever.